Helical gears can be thought of as a refinement to the spur gear design. Instead of being straight cut, the teeth are cut at an angle which allows them to mesh with other gears at right angles or parallel to the helical gear. Though they are more difficult to make, they are quieter and have other superior performance characteristics. Helical gears are used for the same purpose as spur gears, in that they are used to connect shafts on parallel axes. If made to equivalent levels of accuracy to those of a spur gear, helical gears are better in terms of load carrying capacity and quietness in operation. On helical gears the teeth are cut at an angle to the axis of the gear. 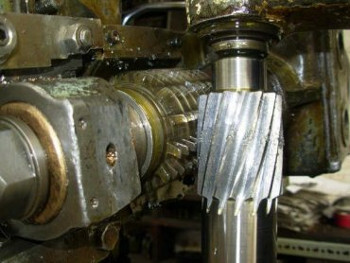 As the line of contact on a helical tooth is not parallel to the axis, tooth contact and loading is gradual and is highly advantageous at higher speeds when spur gears are not practical. Helical gears are manufactured on the same machines as spur gears, although primarily on planing and hobbing machines. They can be shaped, but this requires special cutters and guides for these type of machines.